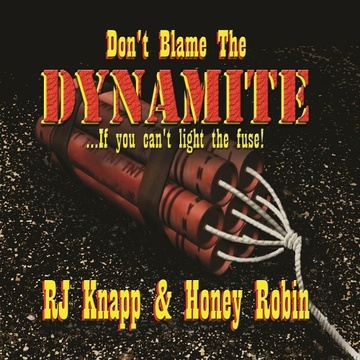 the RJ Knapp & Honey Robin band, the exciting new addition to the artist roster at Critical Sun Recordings, announce the release of their explosive new album, Don’t Blame the DYNAMITE…If you can’t light the fuse! Chicago born RJ Knapp, is a 30 year veteran of the Seattle music scene, and has played music ranging from Classic Rock, Top 40, to Soul, Funk and Blues, from California to Canada. Second only to his phenomenal guitar playing skills, are his song writing abilities. While playing in Seattle’s Pioneer Square circuit in the 80's, RJ was given the moniker of Mr. Bluz, that stands to this day. Robin "Honey Robin" Mahaffey brings her smooth and sultry voice to the blues! With her classical training and background in Opera, Swing and R&B, she is now setting the Seattle blues scene ablaze. Her sizzling cuts, "Ready for Times" and "Hole in My Heart", are highlights of RJ Knapp & Honey Robin's new CD. Also classically trained bassist Robert Baker spreads his licks over the bottom of every song, like real butter on fresh baked bread – you just want more.